Wikivoyage, which became part of Wikimedia Foundation in January 2013, is a wiki style worldwide online travel guide. Wikivoyage was created by a group of editors at the older, for profit travel site Wikitravel who were unhappy with that site’s management. Because content at Wikitravel was created by the community and licensed under a Creative Commons license, Wikivoyage could legally copy or “fork” Wikitravel’s content. The site is organized as a travel guidebook with articles hierarchically organized by continent, country, regions of countries, cities and districts within cites. There are also articles about hotels, restaurants, parks, festivals and other attractions as well as suggested travel itineraries and language phrasebooks. 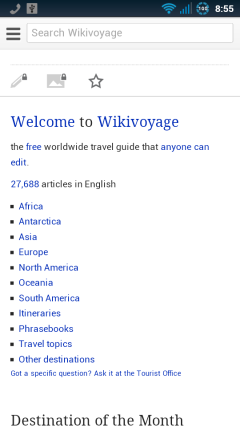 The English edition of Wikivoyage currently has over 27,000 articles. English is one of 15 languages that Wikivoyage is published in. One of the advantages of the fork to Wikimedia hosting is that the site runs on the latest version of MediaWiki, the software that powers Wikipedia, including MediaWiki’s proven and polished mobile template. 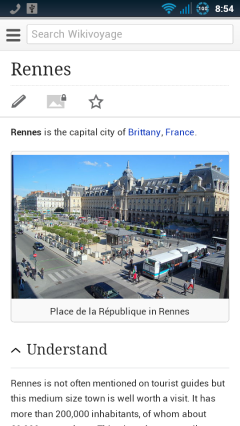 This entry was posted in Travel and tagged mobile site review, travel guide, wiki by Dennis Bournique. Bookmark the permalink.